The Jelling stones (Danish: Jellingstenene) are massive carved runestones from the 10th century, found at the town of Jelling in Denmark. The older of the two Jelling stones was raised by King Gorm the Old in memory of his wife Thyra. The larger of the two stones was raised by King Gorm's son, Harald Bluetooth, in memory of his parents, celebrating his conquest of Denmark and Norway, and his conversion of the Danes to Christianity. The runic inscriptions on these stones are considered the best known in Denmark. The heritage site: The runestones in the foreground, in front of the church graveyard. In the far background is one of two mounds. 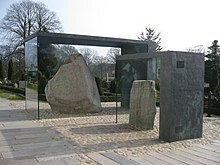 The stones are strongly identified with the creation of Denmark as a nation state. Both inscriptions mention the name "Danmark" (in the form of accusative "tanmaurk" ([danmɒrk]) on the large stone, and genitive "tanmarkar" (pronounced [danmarkaɽ]) on the small stone). The larger stone explicitly mentions the conversion of Denmark from Norse paganism and the process of Christianization, alongside a depiction of the crucified Christ; it is therefore popularly dubbed "Denmark's baptismal certificate" (Danmarks dåbsattest), an expression coined by art historian Rudolf Broby-Johansen in the 1930s. After having been exposed to the elements for a thousand years, cracks are beginning to show. On 15 November 2008 experts from UNESCO examined the stones to determine their condition. Experts requested that the stones be moved to an indoor exhibition hall, or in some other way protected in situ, to prevent further damage from the weather. In February 2011 the site was vandalized using green spray paint, with the word "GELWANE" written on both sides of the larger stone, and with identical graffiti sprayed on a nearby gravestone and on the church door. After much speculation about the possible meaning of the enigmatic word "gelwane", the vandal was eventually discovered to be a 15-year-old boy with Asperger's Syndrome and the word itself was meaningless. As the paint had not fully hardened, experts were able to remove it. The Heritage Agency of Denmark decided to keep the stones in their current location and selected a protective casing design from 157 projects submitted through a competition. The winner of the competition was Nobel Architects. The glass casing creates a climate system that keeps the stones at a fixed temperature and humidity and protects them from weathering. The design features rectangular glass casings strengthened by two solid bronze sides mounted on a supporting steel skeleton. The glass is coated with an anti-reflective material that gives the exhibit a greenish hue. Additionally, the bronze patina gives off a rusty, greenish colour, highlighting the runestones' gray and reddish tones and emphasising their monumental character and significance. Engraving of an animal on one face of the stone. The figure of Christ on Harald's runestone. The stone has a figure of the crucified Christ on one side and on another side a serpent wrapped around a lion. Christ is depicted as standing in the shape of a cross and entangled in what appear to be branches. This depiction of Christ has often been taken as indicating the parallels with the "hanging" of the Norse pagan god Odin, who in Rúnatal gives an account of being hung from a tree and pierced by a spear. The 1936 sign next to the Utrecht stone with the original runes, transliteration and Dutch translation. In 1955, a plaster cast of this stone was made for a festival in London. It is now located in the grounds of the Danish Church in London, 4 St. Katherines Precinct, Regents Park, London. The copy is painted in bright colors, like the original. Most of the original paint has flaked away from the original stone, but enough small specks of paint remained to tell us what the colors looked like when they were freshly painted. A copy is also located in the National Museum of Denmark, and another copy, decorated by Rudolf Broby-Johansen in the 1930s, just outside the Jelling museum, which stands within sight of the Jelling mounds. Another copy of this stone was placed in 1936 on the Domplein ('Dom Square') in Utrecht, next to the Cathedral of Utrecht, on the occasion of the 300th anniversary of Utrecht University. A copy exists in Rouen, Normandy, France near Saint-Ouen abbey Church offered by Denmark to the city of Rouen, on the occasion of the millennium of Normandy in 1911. A facsimile of the image of Christ on Harald's runestone appears on the inside front cover of the Danish passport. The inscription on the older and smaller of the Jelling stones (Jelling I, Rundata DR 41) translates to "King Gormr made this monument in memory of Thyrvé, his wife, Denmark's adornment." 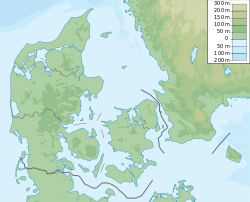 ^ Lokalhistorie fra Sydøstjylland, Historisk Samfund for Sydøstjylland og bidragyderne (2010), p. 83. ^ "Eksperter: Runestenene skal reddes". Danmarks Radio. 16 November 2008. Retrieved 16 November 2008. ^ a b Ritzau (20 February 2011). Jellingstenen skal renses hurtigst muligt. Kriteligt Dagblad. Retrieved 3 April 2017. ^ Skarum, S. (7 March 2011). Jellingstenen er reddet – næsten. Berlinske. Retrieved 3 April 2017. ^ "Jelling Stones get designer cases". Copenhagen Post. 5 March 2010. Archived from the original on 15 March 2010. ^ a b Covering of the runic stones in Jelling, Denmark. – Copper Concept. Access date: 13 July 2012. ^ Stefan Brink, Neil Price, The Viking World, Routledge (2008), p. 277. ^ a b Kure, Henning (2007). "Hanging on the World Tree: Man and Cosmos in Old Norse Mythic Poetry". In Andrén, Anders; Jennbert, Kristina; et al. (eds.). Old Norse Religion in Long-Term Perspectives: Origins, Changes, and Interactions. Lund: Nordic Academic Press. pp. 68–73. ISBN 978-91-89116-81-8. pp. 69–70. Wikimedia Commons has media related to Jelling Runestones.